There is something so classic and elegant about a bridal portrait. Once Adrienne Lugo finished with Preston's stunning hair and makeup, we had Preston get into her wedding gown and then take a seat on the floor. Yes, the floor. 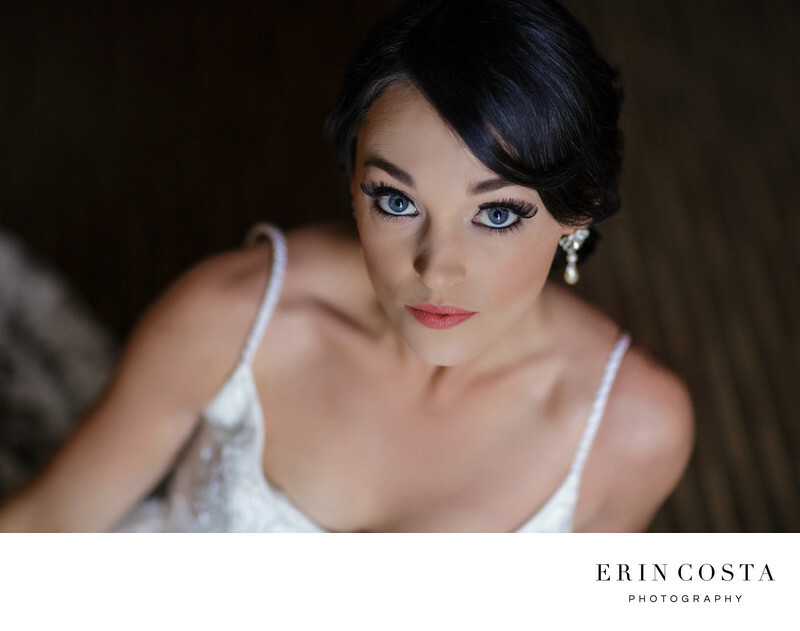 This angle allows for a very flattering close up bridal portrait, showcasing the hair, makeup and neckline of the dress. Preston's blue eyes where enhanced with gorgeous lashes and immediately draw you into this photo. Her subtle smile completes the mood and feel of the photo and it has instantly become of our favorite bridal photos. Preston and her bridesmaids got ready at the Hilton Wilmington Riverside, which was located just a few blocks away from her ceremony and wedding reception venue, The Atrium by Ligon Flynn. The Hilton Riverside is the perfect location for bridal parties to get ready with its near proximity to several of the downtown Wilmington wedding venues. The views of the Cape Fear River are stunning and the rooms are nice and large, perfect for groups to get ready. We would definitely recommend getting ready at the Hilton Riverside if you are planning a downtown Wilmington wedding! Location: 301 N Water St, Wilmington, NC 28401.